A lot of times it happens that people need to use a specific video format. Your device may not support all formats and in such cases, you may find the need to convert from one format to other. For example, you want import M4V to iMovie on your Mac, how to solve the format compability problem? 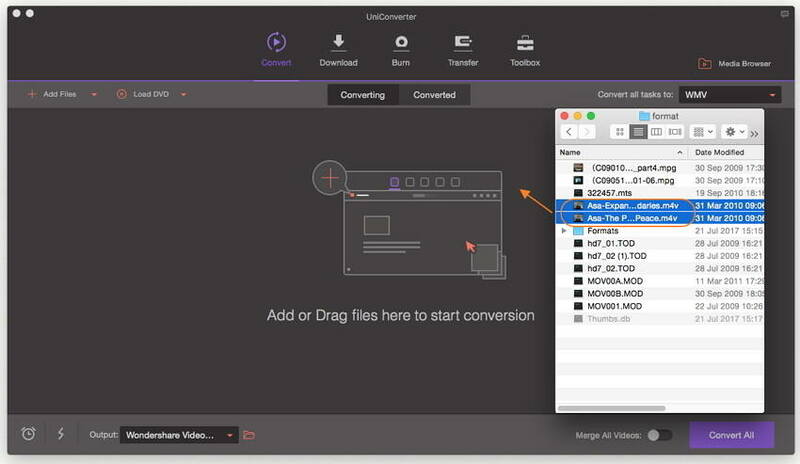 While there are plenty of video converters available; we would recommend using Wondershare UniConverter for Mac (originally Wondershare Video Converter Ultimate for Mac) because of the flurry of features which it has to offer. iMovie is the player for MAC and Apple devices. It doesn’t have the codec to support a wide variety of different file formats. While iMovie does come with some of the best features and can help you in editing fie, one of its major constraints is that it allows only a few formats. M4V format is not supported by iMovie and if you are looking to import it, you will need to first get it converted to a suitable format and then you can play it on iMovie. iMovie currently supports just the popular formats like MOV, MP4 and so on. Wondershare UniConverter for Mac (originally Wondershare Video Converter Ultimate for Mac) is one of the popular software which comes with a clean, neat and easy to use interface. This software is so designed that it can easily convert video files from one format to another. Here are some of the key features which it has to offer. 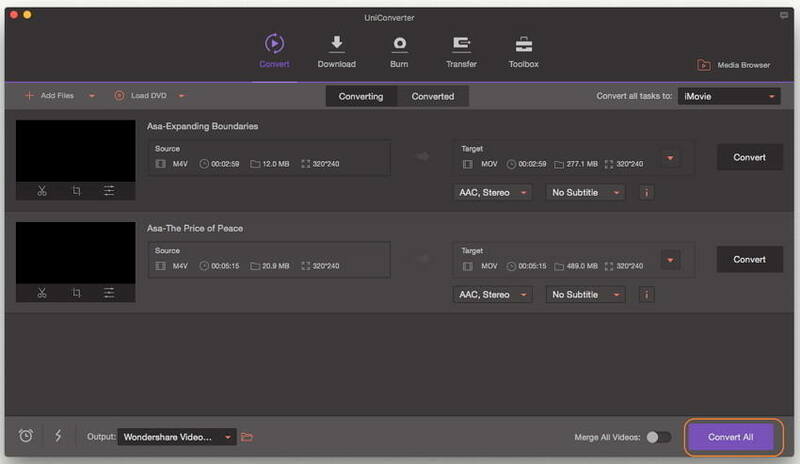 The converter supports as many as 159 different formats and new formats are being added continuously. Convert video 30 x faster. It also supports the 4k video format as well. You can convert 2D videos to 3D as well and that too at amazing speed. Merge different files together to make one composite video. Add subtitles for better understanding. De-interlacing and special effects offered. You can change the aspect ratio as well. Download YouTube video and other video from 1000+ video sharing sites with the help of a single click as a smart download button will appear. You can direct download YouTube to mp3. It allows easy streaming of the media to your TV. It comes with an inbuilt DLNA support. It has the high efficiency video codec installed in it and so it can offer twice the compression of the video as compared to H.264 but at the same time, it retains quality. This really saves a great deal of space. You can transfer videos to both Apple and Android mobiles without the need for a USB cable. It comes with an easy to use interface and requires little or no extra learning. Now that you are aware of the features, let us see what are the key steps to be followed for actually converting m4v video to iMovie format. The first thing to do is to download the latest version of Wondershare UniConverter (originally Wondershare Video Converter Ultimate) via the download button above. Once you have downloaded, make sure to install it on your system by following the instructions. When that is done, launch it. Then simply drag and drop your target M4V movie to the program. Or you can click the Add Files button to import M4V video from your local computer. Click the icon beside Convert all tasks to: box and select Editing tab, choose iMovie in the left sidebar and the video resolution in the right. Hit the Convert button when everything is set and it will start converting M4V to iMovie. To move the video to iMovie, click on the File tab at the top, then go to Import > movie to import the video files to iMovie.